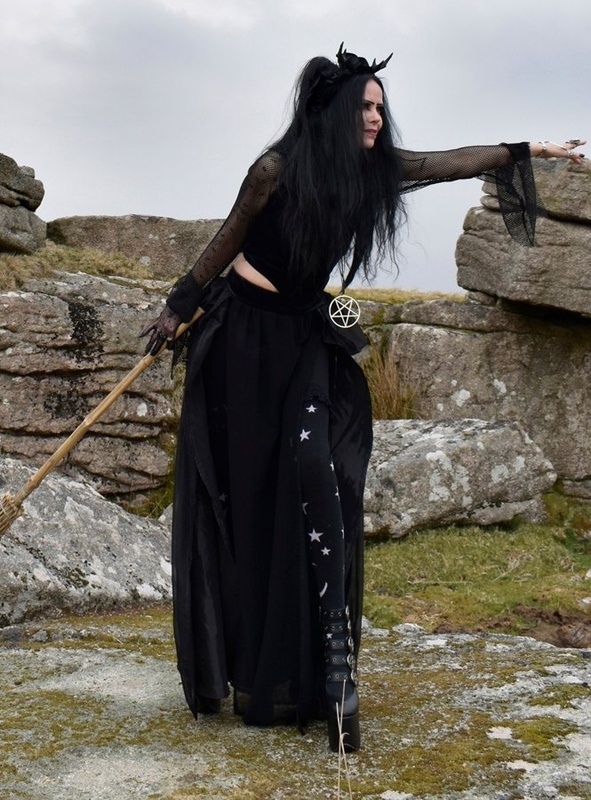 Here's the Broommaiden Skirt; the darker, spookier version of our Pocus Hocus Ensemble!<br> <br> With a steamed velvet waistband, it's available in all sizes, and is of course exclusive to Moonmaiden Gothic Clothing - the skirt has a split taffeta underskirt, with rouched chiffon back and side panels; and a sheer mesh front panel.<br> <br> Please note the mesh panel is sheer, so you'll need to wear leggings or a skirt of your choice underneath! Here's the Broommaiden Skirt; the darker, spookier version of our Pocus Hocus Ensemble! With a steamed velvet waistband, it's available in all sizes, and is of course exclusive to Moonmaiden Gothic Clothing - the skirt has a split taffeta underskirt, with rouched chiffon back and side panels; and a sheer mesh front panel. Please note the mesh panel is sheer, so you'll need to wear leggings or a skirt of your choice underneath!